While only a handful of carriers will support Apple’s Dual SIM (eSIM) at first, its arrival within the new 2018 iPhone range heralds more rapid adoption of the technology in the future, as industry consensus has mostly been achieved. The promise of eSIM technology is that users can swiftly switch between network providers on the fly, accessing the best available deal or strongest coverage as they go. In truth, this isn’t quite how it works — it is conceivable that it could, but linking up with a new carrier also means porting your phone number, and that’s a task that takes time where it is possible at all. Dual SIM is also a big deal in emerging markets. Apple is making it possible to carry both a physical SIM from your primary carrier, as well as a built-in eSIM inside of its devices (except in China where local regulation demands use of physical SIM cards). You won’t be able to use this dual-SIM technology from the moment you take your brand-new device out of its box because Apple says it needs to enable the feature with an iOS 12 software update it intends to ship in a few weeks’ time. 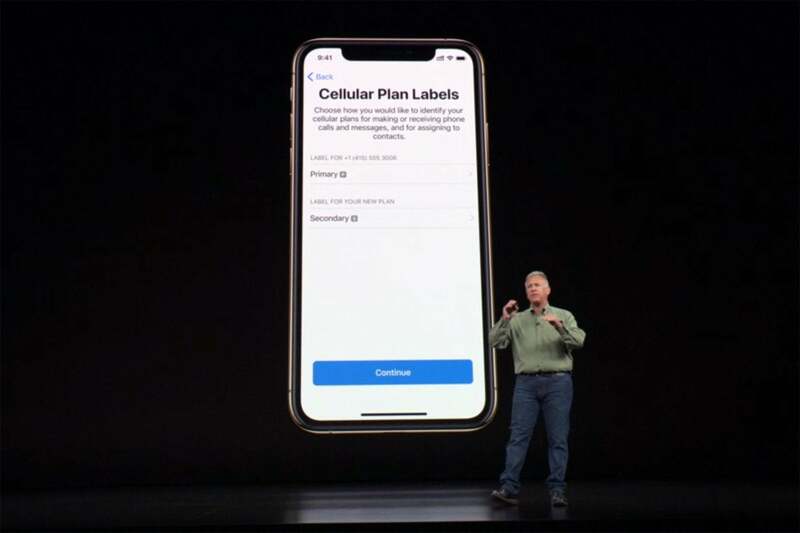 Apple says the feature is intended for people who need two phone numbers (work and home, for example, or who want to use two different plans (international and domestic lines, or two PAYG packages), and for those who wish to travel with a local plan — enabling the locally available eSIM when they land, in other words. The limitation of Dual SIM is that your iPhone needs to be unlocked in order to provision your eSIM for use with a different carrier, otherwise you must provision it with the same carrier as your device is locked to. I guess some carriers may figure out alliances with other carriers to free that process up for international travelers. How do I enable my eSIM? If you have an unlocked iPhone XS, XR, or XS Max, you need to get a QR code or a carrier app from a network that supports eSIM. Open Settings>Cellular, tap Add Cellular Plan and scan that QR code, and your second line will be automatically provisioned for you. You may need to enter a confirmation code, and you can enter information manually if necessary. Get the app, purchase a plan. If you don't have a normal SIM and your carrier supports it, an eSIM can serve as your only cellular plan. There also will be an eSIM in the #iPhoneXs and #iPhoneXsMax. Can I use multiple carriers on my eSIM? If you travel a lot, you might want to enable your iPhone for use with multiple carriers. The good news is that you actually can store more than one eSIM in your device, though only one can be active at any time. You switch SIMs in Settings>Cellular>Cellular Plans. How do I manage my plans? How do I use two (or more) phone numbers? Once you set the service up, both of your phone numbers can make and receive voice calls and send and receive messages. Apple has thought up some clever ways to automate this feature. For example, if you call someone using one of your lines, your iPhone will use the same number to call them the next time you call that contact. If you haven’t called someone before, it will use your default number, and you can also choose which number to call from when you call someone in your Favorites list, or when using the keypad. You also get to see two icons for network coverage at the top of your iPhone’s display. Who will support Dual SIM? You will also be able to use services from GigSky and Truphone worldwide. Apple helped design the eSIM specification, but it didn’t work alone. It first won an Apple SIM patent in 2011, joined the GSMA in 2015, and has been cooperating with others to develop and deploy the new eSIM standard. It began putting iterations of these things inside iPads in 2016 and Apple Watch since Series 3. Development of the standard hit a hurdle in April 2018, but this is unlikely to delay things for too long. Most networks now recognize that the future is connected. They also recognize that eSIM is a far better alternative when it comes to getting tens of billions of devices online than standard SIM tech. Yes, there is a trade-off. Traditionally, SIMs have helped network operators keep you locked to their services. This is changing. Networks want to keep their customers, but as T-Mobile shows with its hugely customer-friendly approach, or as Orange with its Orange Business Services demonstrates with its high-end enterprise services, the networks are looking to reposition themselves as something more engaging than dumb network-provision pipes. That’s in the long term. More immediately, I think operators will begin to offer downloadable SIM profiles that they make available via the Apple eSIM. They aren’t just doing this for Apple, however; dozens of networks and a number of device manufacturers are expected to introduce eSIM support across the next couple of years. It is unknown if Apple will demand a slice of the action from networks wanting to offer connections via the eSIM, though Counterpoint thinks it likely. “Apple can be the gatekeeper now, since it will have control over eSIM. Thus It will demand a revenue cut for the activations happening through eSIM,” the analyst wrote. What about an Apple network? It is also unknown if this heralds a move on the part of the iPhone company to offer its own network (likely by licensing bandwidth from existing incumbents) in the future. I will note that for Apple, offering its own network may seem a little more of a priority once it ships its own connected vehicles, but I think it is more likely to maintain its alliance with the networks. That is because all parties in those relationships enjoy a profitably symbiotic relationship — not least because Apple’s iPhone users are also big users of mobile services, which makes them desirable customers for any network operator wanting to provide next-generation mobile solutions. Apple has good information on how to use Dual SIM iPhones.